Pharmacoeconomic analysis is often based upon incremental cost per increase in survival (cost-effectiveness). Using this definition supportive care measures, which increase quality but not quantity of life, generate a zero denominator and cannot be directly compared with other components of health care cost. Cost-utility analysis, which measures incremental cost per increase in quality-adjusted life-years (QALY), where QALY=utility score x time at risk, addresses this problem, since successful supportive intervention increases the utility score and thus provides a finite denominator in QALY even when absolute survival is unchanged. However, utility scores for various supportive care modalities have not been well defined. As a pilot study to generate a first approximation of a utility score for nausea/vomiting, we used a rating scale technique and administered two visual analogue scale questions to 30 patients completing a cycle of chemotherapy. 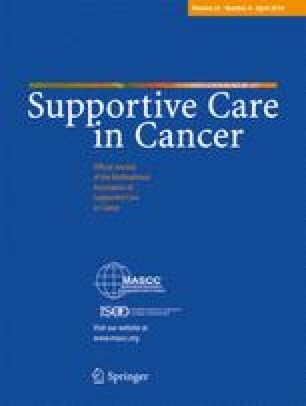 Patients rated their global quality of life during their previous cycle of chemotherapy with hypothetical absence or presence of nausea/vomiting as the only variable. The study population included 8 male and 22 female patients, with a median age of 56 years. The most common malignancies were breast cancer (8 patients), lung cancer (7 patients), and hematologic malignancies (7 patients). On a 100 mm visual analogue scale, the mean score for overall quality of life during chemotherapy was 79 mm without nausea/vomiting and 27 mm with nausea/vomiting (P<0.001, pairedt-test). The implied marked increase in utility with relief of nausea/vomiting suggests a significant impact on cost-utility analysis. Similar methodology could be used to estimate utility scores in other areas of supportive care.